Monochromatic greys and greens were the view out the window this morning. But inside the tea was hot, the atmosphere convivial, and the food delicious. No need for sunshine. After breakfast we walked along the sea wall in Sidney. Expansive ocean views to one side and in the gardens lining the pathway wonderful signs of spring. The trees are beginning to bloom, delicate pinks and whites that make a living Valentine. It's so early! And the crocuses! Well, you can see for yourself how gorgeous they are. Purple, white, striped, and a few yellow ones. Spring seems to be well on the way. I'm writing this on Saturday evening after a day of doing very little. It's been wonderful. I hope your weekend is equally relaxing. Linking to Sunlit Sunday and Mosaic Monday. Such pretty blooms to break up the blandness of greys and greens; little signs of spring peeking through the winter. Have a lovely week, Lorrie! Wow, Lorrie! 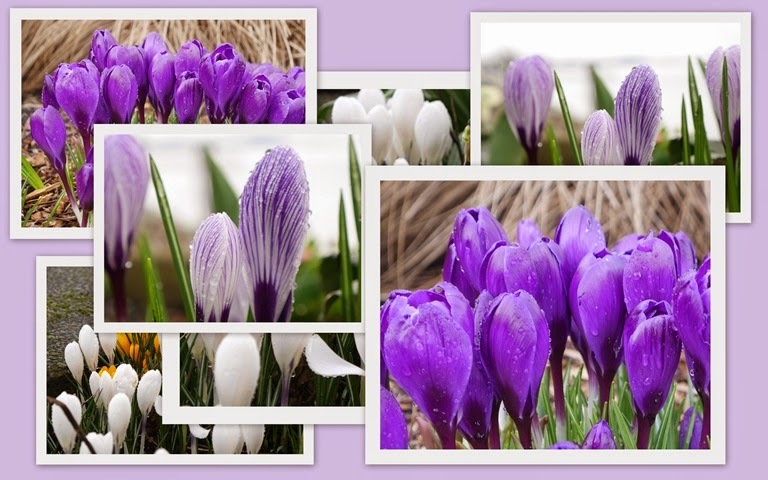 That is the best selection of Spring flower photos I've seen yet! Stunning. What a treat, all round : ) For you ~ and us! Ooo how exciting for you Lorrie, to see the little crocus pushing their heads through the soil and flowering! The blossom is gorgeous too, Spring is such a wonderful time - the season of hope! And the mosaics you created are really elegant! What amazing crocus (crocii?). I still have only two purple flowers in my crocus bed, I think it is just too cold and wet for them. How lovely to see the first prunus flowers. Your earliest spring flowers are gorgeous. They are always such a welcome sight. Your relaxing day sounds wonderful. Think I might have one of those today :). Very pretty and the hope of Spring! It won't always be winter! At this time of year I think we truly live in paradise! Oh my, just look a those spring blossoms! How beautiful to see. I'm glad that you had a relaxing and quiet day after your busy week of teaching and before this coming week. Take care. Simple beauty in the spring blossoms. I'm glad you enjoyed a day doing nothing, though I doubt that it was nothing. After a busy week it sounds like just the ticket. Very lovely crocus and the trees already in bloom. Wow, it is spring wherever you are! Looking forward to some color here in east TN. Tomorrow the weatherman predicts the color will be WHITE. Ugh! Hello, I love your mosaic of blooms. So pretty. I wish it was spring here, not even a sign of it.. Lovely images, have a happy week! It is always such a joy to have spring return. Have a beautiful day dear one! I had to read back to see about your teaching commitment and realize that you'd been to Mexico. I'm not sure where I thought the whaling trip occurred. By Canada I guessed. I know you'd make a great teacher and I bet the kids are happy to have you. I'm glad you know to take care of yourself through the increased commitment. I can't believe all the flowers you are seeing blooming. It's really cold here in the midwest USA again. The blooms and crocuses are a welcome sight of your early spring, so beautiful. I have a cousin that lives on Gabriola Island that has been posting wonderful pictures of blossoms on her FB. Very early spring! I know that you'll take it and enjoy it. Doesn't look one bit like spring here so I will enjoy seeing yours unfold. It's so nice to see colorful spring is coming bulbs, it's one of my favorite times. Of course...here it will take a little longer..but I can enjoy yours. Wow you already have gorgeous blooming trees. We're still several weeks off from seeing pretty blooming trees. A few crocus have bloomed but that's about it. I enjoyed your lovely photos. Very pretty flowers. Love their colors. Wow...these photos are just stunning! Spring blooms, especially flowering trees make my heart sings! We are getting our first snow here in NC starting today with bitterly cold temps. It will be a little while before we see any of these lovely blooms around here. Have a great week! it is lovely to see the new blooms bursting out. It will be spring soon! Have a lovely week. I'm so envious that spring is starting where you live already! I won't see this until April. Love the beautiful blooms- a happy sight for the winter blues! 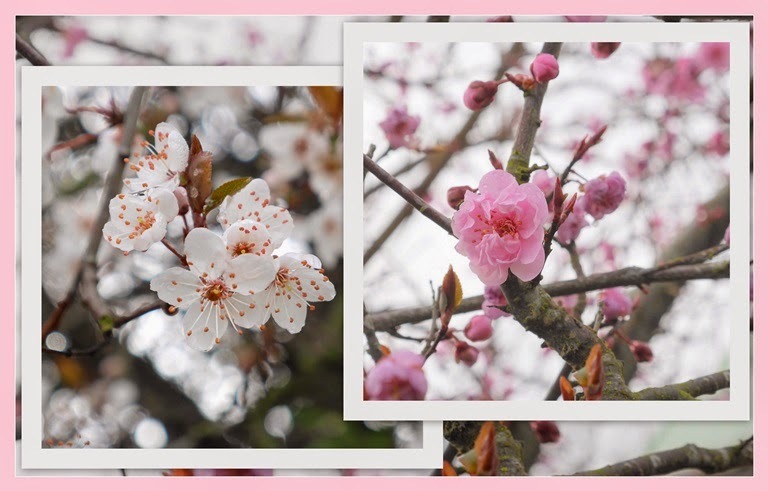 Is there anything quite as inspiring and lovely as the first blooms of Spring-they always bring a song to my heart, and a lightness to my spirit and step. How lucky to have such lovely blooms now! Oh my I have fallen in love with those purple crocuses. They are so beautiful. You found some lovely color! Flowers, beautiful flowers, I needed this colour this morning...Thank you! I did not get to leave on my journey yet as we are in a state of emergency in KY and I now will leave next Tuesday. All is well, but we live in a valley and when Winter strikes like this, we cannot get out...at all. First - I love the new header. The flowering trees are gorgeous and love the mosaic of the crocus. We took a nice ride this weekend and saw a lot of different flowering trees too - and daffodils. They say the daffodils are beginning to bloom in Skagit Valley - we must get down there soon. They are about 2 or 3 weeks early - hope everything isn't all bloomed out before the Daffodil Festival - have you ever gone to it? Such beautiful spring flowers! Your climate is definitely ahead of many areas! I look forward to spring! I had a lovely weekend as well. It so quickly evaporates into memory though! It feels like April right now. We have rhodos blooming in the garden. We walked on the seawall at English Bay yesterday and it was balmy. How very pretty your photos are, Lorrie! Big, fluffy flakes are falling here, a different kind of loveliness. My spring flowers are limited to a small pot with a hyacinth bulb. I'll enjoy watching it bloom soon!